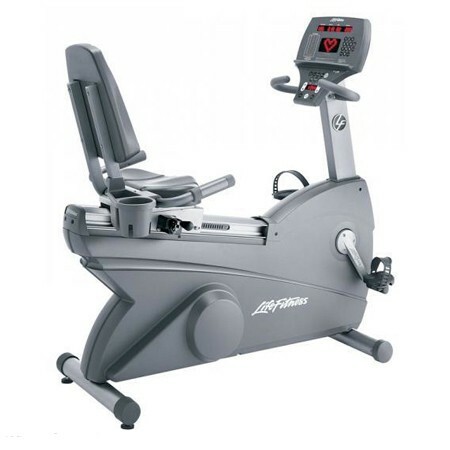 The Life Fitness 95R Inspire Recumbent is taking cardio fitness to new heights, it delivers an immersive exercise experience, motivating exercisers --- whatever their fitness level. Integrated consoles and Attachable TVs give users access to their favorite TV programming, iPod music and video, a virtual trainer and the ability to create workouts and track results. A long-time leader in exercise innovation, Life Fitness is taking cardio fitness to new heights with personalized exercise experience. Advanced Console Technology - Inspire the senses with seamless iPod integration, USB compatibility, Virtual Trainer, Workout Landscape™ Perspectives. Sight, sound and performance come together in the Inspire™ Console, built on the most advanced technology in the fitness industry. Step-Through Design - Allows users to easily get on and off the seat. Deluxe Armrest Option - New armrests allow for a more relaxed position and support user's forearms to alleviate tension in the shoulders while reading. Comfort Curve Seat with Easy Adjustments - Newly designed seat with ample thigh clearance provides maximum comfort. Ratchet seat adjustment makes it easy for users to adjust the seat height, evenwhile in a seated position. At-Your-Fingertips Resistance Controls - Users can easily adjust workout intensity with controls located on the armrests and side handlebars. Heart Rate Monitoring - Lifepulse™ digital heart rate monitoring hand sensors are conveniently placed on the deluxe armrests and side handlebars to provide precise heart rate monitoring, and Polar telemetry provides accurate, "hands-free" heart rate monitoring. DVD/CD/Laptop Compatibility: Connect a DVD/CD player or laptop directly into the Attachable TV (requires additional external cord not supplied by Life Fitness). Motivating Workout Variety - Zone Training+™ workouts automatically adjust the resistance level to keep users in their target heart rate zone. Engage and Inspire consoles also include goal-based workouts, Fitness Test, and the machine-prompting Aerobics Trainer program to keep users motivated.